Un éxito. En portería. Cómo empresaria de auxiliares de servicios. Un 10. Muy atento y agradable. Soddisfatti nel complesso, manca soltanto la possibilità di poter affacciarsi e godere di un bel panorama. 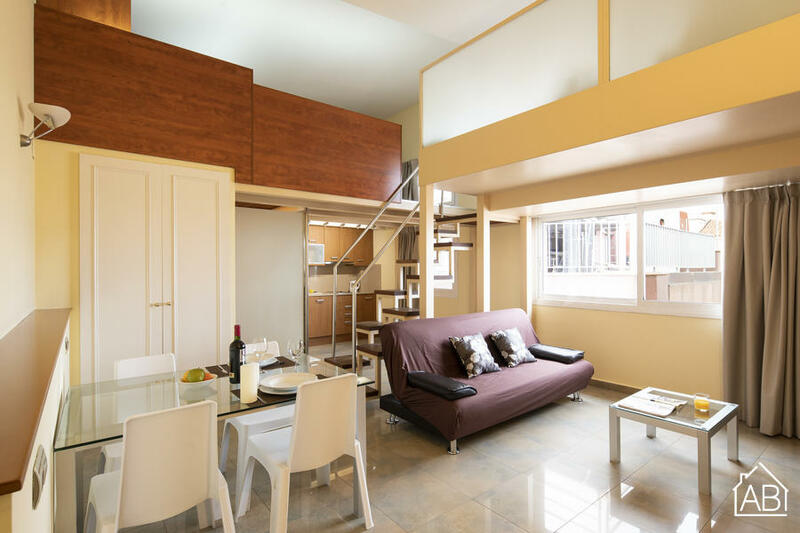 This modern Barcelona apartment is ideal for couples, or a group of friends looking to stay in one of the most exclusive streets in the city: Passeig de Gràcia. This apartment is situated close to two of Gaudí´s well-known masterpieces: Casa Batlló and La Pedrera, as well as some of Barcelona´s most famous designer stores. The apartment itself has been renovated and is situated on the top floor of the building. Accommodating up to five people in total, it has its own second storey, accessible by a modern staircase, where you will find stylish wooden floors and a double bed. The living room has a dining table, TV and a comfortable double sofa bed. The apartment also has an Internet connection, allowing you to keep in touch with friends and family at home. The spacious kitchen follows the same modish style as the rest of the apartment and is well equipped with up-to-date appliances and utensils. The bathroom is bright and tiled with a sizeable walk-in shower. With heating and air-conditioning, this comfortable and chic apartment is a great choice for your stay in Barcelona at any time of year. Please note: This apartment is only available to guests over 26 years old. Parties in the apartment are not permitted and we kindly ask all guests to respect the neighbours by not making excessive noise. Eixample is Catalan for ´extension´, meaning an extension of the old Barcelona city, and it is one of the most popular districts in the Catalan capital. Eixample was designed by Catalan-born architect, Ildefons Cerdà, who took traffic and sunlight (amongst many other things) into consideration when drawing up the plans of the new area. Eixample is now characterised by its octagonal blocks and its grid-like pattern, with wide streets and both commercial and residential areas. It is split into two parts, Eixample Esquerra (Left, or in Spanish, Izquierdo) and Eixample Dret (Right, or in Spanish, Derecho), and is home to one of the most famous streets in Barcelona, Passeig de Gràcia, known for its high fashion stores and trendy restaurants. The street is intersected by the long Avinguda Diagonal, which runs through the entire city. Eixample Derecho is home to many gems of ´Modernisme´ architecture, including the unique Casa Milà (La Pedrera), the colourful Casa Batlló and the towering Sagrada Familia, known as Gaudí´s unfinished masterpiece. You will also find plenty of great bars and cafés here, too, and if you decide to choose one of the many Barcelona apartments in Eixample Derecho for your stay, you will be able to easily explore the city, due to the neighbourhood´s convenient, central location and excellent public transportation services.